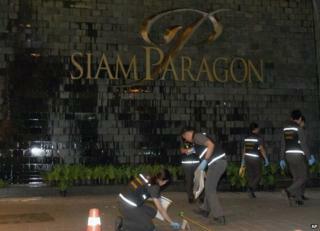 Police in Thailand are investigating two bomb blasts outside a luxury shopping mall in Bangkok. One person was injured in Sunday's blasts, but the small homemade devices were not intended to kill, police said. They were detonated on a walkway connecting an overhead train line to Paragon shopping mall. It is the first such incident since a military coup in May and comes days after former Prime Minister Yingluck Shinawatra was impeached. Prime Minister Prayuth Chan-ocha ordered security to be ramped up in the capital following the blasts. "I have ordered security to be tightened because this case involves the well-being of the people," he told reporters according to Reuters news agency. "This case shows that we still need martial law ... there are still bad people disrupting the peace. We must find ways to severely punish them." Police said the steel pipe-bombs were hidden behind electric controls on the elevated walkway and were set on timers to explode at about 20:00 local time (13:00 GMT), the busiest time for shopping and dining out in the area. Police Lieutenant General Prawut Thawornsiri, a spokesman for the Royal Thai Police, said the motive behind the attack was not known, but the bombs seemed intended to create panic rather than kill people. Police initially said the explosions were cause by a transformer malfunctioning. After months of street protests, which sometimes turned violent, Thailand has been relatively peaceful since the military took control in a coup in May. The army has placed Thailand under martial law, suppressed dissent and banned political meetings. But bitter divisions remain between rival political factions. Last month, Ms Yingluck - an elected prime minister who was removed by a court shortly before the military ousted her government - was handed a five-year ban from politics. A former MP and key leader of the "red-shirts" group that is her support base was also jailed for two years. These moves have been seen as evidence of a tougher military stance against Ms Yingluck and her exiled brother Thaksin Shinawatra, also ousted by the military as Thai prime minister. Thailand is deeply divided between supporters of the Shinawatra family, mainly rural farmers, and the Bangkok elite that accuses them of corruption. During the months of protests before Ms Yingluck was ousted there were violent incidents, some involving grenades and small explosions. Observers said armed factions on either side of the protests could have been to blame.